Finally, I wrote King. Thanks to his response to my previous fan letter, I had his office address, so I wrote to him there, instead of via his publisher, which is probably where I sent my earlier missive. I don’t have any memory of the content of this letter, but knowing me it was probably brief and to the point. How could I get my hands on a copy? To my delight, I received the letter that is reproduced on page 11 of The Road to the Dark Tower, telling me that he’d authorized a second printing and I could get one for $20 from Donald M. Grant. It was my first purchase of a book from a specialty press and it was a major outlay for a poor undergraduate who hadn’t yet started buying hardcover copies of King’s books. I can’t say how many times I read The Gunslinger. Delah, as Roland Deschain would say. I absolutely loved its mood. I wasn’t familiar with the Robert Browning poem, and I didn’t know much about spaghetti Westerns—I was more familiar with Clint Eastwood as Dirty Harry Callahan—but there was something about this bleak world that captivated me. Roland wasn’t as frustrating a protagonist as Thomas Covenant (I was immersed in the Second Chronicles at about this same time), but he was a hard guy to like. But I was in awe of him, nonetheless. Great essay, Bev! I couldn’t think of a better guest essay writer for a Dark Tower book than yourself. Again, wonderful info Bev. I’m with you, he had me from the get go. Same for me Bev. Loved the series from the get go – Drawing of the Three – is my fav. What a ride this turned out to be. And the series is the poster child for why cross-genre fiction can be so fantastic! Yes Mr. King we readers do love us some stew! I had a smaller thin leather (ish?) cover copy — brown or black — of this book when it first came out. I loved it! A friend borrowed it and I never saw it again. Does anyone recognize what I may have had? I tried to get it back for years? Thanks. I don’t know what that could have been. The only edition for many years was the Donald M. Grant hardcover. Maybe your copy was just missing a dust jacket? I bought it at a very obscure SciFi/Fantasy bookstore in Santa Barbara when it first came out (or soon after) and it was a limited edition and quite expensive. I don’t have many regrets, but loaning out THAT book is one of them. This might be completely off-base but I seem to recall reading way back in the Castle Rock newsletter that King used to produce small issues of this story for gifts for friends. It stuck in my head because, at the time, it was the only thing that I couldn’t get my hands on. Perhaps you had one of those? Might be… It was smaller in size, brown/black (?) With gold writing. Quite plain, but classy. No book jacket at all. Very well made and special. I have never seen another, although I have looked! Thanks, Michael. I was lucky and read THE GUNSLINGER in its original appearances in F&SF, and was absolutely fascinated (and hooked). I’ll be interested to see if there’s any commentary on the differences–small, but definite–between the original versions and the revised versions of those first stories, particularly the first one. I’m still fond of the original–it has a lovely undergraduate callowness that reminds me of my own early experiments in writing. In an appendix in The Road to the Dark Tower, I looked at the synopses that King wrote for the second through fifth installments in F&SF wherein he summarized the story to date. I was mostly fascinated by his evolving understanding of the relation between Walter, Marten and the Man in Black. My experience was much the same as yours except a buddy, a fellow Stephen King fan, asked me if I’d ever read it. I hadn’t even heard of the book so I asked my bookstore manager if he had a copy. He told me he didn’t but he’d search around. About three weeks later he called me and said he had a copy for me. I went over to his store and picked it up and had to pay him $200.00 for it. That’s the most I’ve ever paid for a book. I found out who the publisher was, made contact and got on their mailing list. I was able to pick up all the other volumes from them much, much cheaper and now have the complete collection inscribed by Mr. King except The Gunslinger. I’m getting advanced in years and don’t know who to leave them to. Even if I told my kids about them I feel they wouldn’t appreciate what they are and would start reading them, breaking the spine and maybe even underlining or putting their name in them. I just learned that there are 500 copies of The Gunslinger inscribed by Mr. King. I had heard that he didn’t sign any of them. I don’t know how to contact who has them but would fall to my knees to have mine signed. In so far as I know, I have copies of every hard back that he has written. I have been able to get advanced notice of upcoming books from Century Club but have never been able to get any others signed. I see them now and then on eBay, but they go so high I can’t even try to bid on them. My social security check keeps me from doing and getting much of what I used to do. Unfortunately I didn’t hear that Mr. King was coming to Dallas and the chance to meet him was advertised. Love the series. Absolutely hated the ending. I know it “makes sense”, but after reading all 7 books and finally reaching the Tower and the Man In Black to have that ending just left me pissed off at the end for a very long time. But…did you like the ending? Still bugs me to have that ending after all the time you invest in reading the story…. He had to end it that way or people would be bugging him to write another story. His way of saying enough. I think, because I was expecting it for so long, I was ready and watching for the steps leading up to that ending in terms of the themes and other dynamics of the story. But I totally understand the point of view of anyone who wasn’t happy with how things turned out after such a very long road to get there! It is the journey not the destination. I had a feeling it would end that way as well, but I can aways enjoy the journey. Ever since I first “met” you in Alt.Books.Stephen-King, many years ago. Your insight and understanding of all things King, especially the Dark Tower has left me blown away. 4.5 years ago I lost my entire collection in a house fire and have only been able to replace a handful of any of the books in any form. Thankfully I have been lucky and have been able to find second hand the first half of the series, something I have been forcing myself to delay rereading again until I have them all. Though they copies will never in my mind fully replace the Grant editions that I lost, most still in their protective shipping bags, as they were not my reading copies. Oh wow… I hadn’t thought about Alt.Books.Stephen-King in a very long time… talk about memories! Yep — those were fun days. I remember how cool it was when we were all reading The Green Mile at the same time. I bought “The Green Mile” in those six small installment books before the big (real) book was released. I just couldn’t wait. Still have those little guys. The Man in black fled across the desert and the gunslinger followed….. And I followed them! I was a teenager and came to an understanding of the existence of the Gunslinger by reading about it on the “Also by…” leaf and I pestered the poor clerk at B Dalton books who was perplexed as to why it was not listed on his microfiche( remember that?). It took me two years to track down a copy and it introduced me to the scary addiction of first edition collecting. 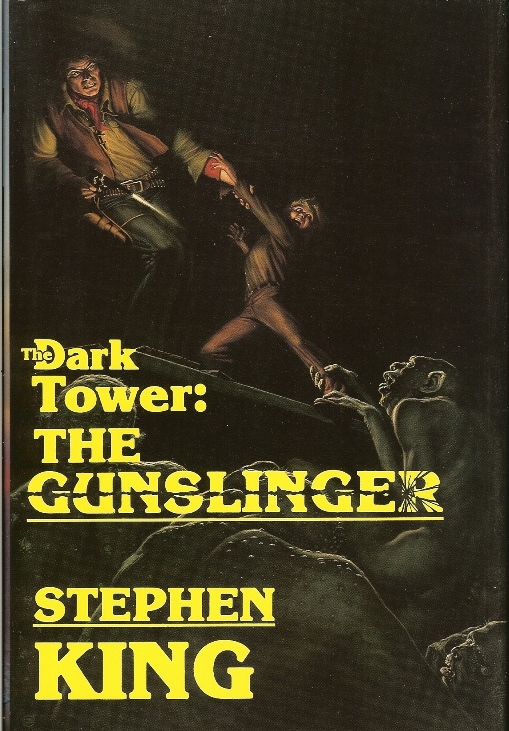 Prior to that find, I thought it would be the pinnacle of collecting to own all of the books by Stephen king in hardback… I now Own the Lettered copy of the gunslinger and a matching number complete set of the Dark tower books. It has been a passion of mine for the past 30 years. I have met a number of interesting and a few shady characters along in this collectors journey.